Working with you to implement a supply chain management solution that drives efficiency! Evolving a wholesales/Distribution company to a new level of growth is more challenging than ever. To achieve growth goal in the world that is increasingly complex and globally competitive, distributor need to implement share common distribution processes and systems. Wholesale distributors must continually increase their efficiency levels, or risk losing market share to their leaner competitors. You need to quickly adapt to changes in the entire value chain, replace costly inventory with supply chain visibility and quick response. Operate effectively and outsource/sourcing manufacturing and minimize the risk associated with reduce inventory and miss delivery. 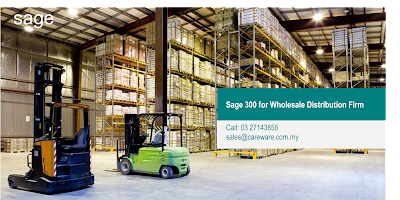 So, give us a call and we help you to solve these challenges with Sage 300 ERP to enhance business productivity and take advantage of best practices for supply chain efficiency, order accuracy, and operational improvement. Powerful, integrated modules to control operations and supply chain will enable your company. • Reduce costs by consolidating inventory and distribution processes and improving cycle times. • Drive continuous improvement through real-time business intelligence and flexible alignment with dynamic shifts supply and demand. • Use strategic sourcing to obtain the best quality supplies at the right price. • Optimize your inventory to keep customers happy while improving the turnover of stock. • Institute advanced order processing system that improves accuracy, speeds up fulfilment, and results in fewer returns. CareWare will work with you to build your Sage 300 ERP solution based on the functionality you require, including the Operations and Distribution modules such as Inventory Control, Purchase Order, Order Entry, and Return Material Authorization. These modules connect seamlessly to accounting, business intelligence, and Customer Relationship Management (CRM) functionality for a complete, end-to-end business management system.